It's taken me a week to get through everything and get here to put it down on paper (hehe...or on the screen, as it may be!). What a week it's been! The beds are not made, there are still a few left overs in the frig, and I'm still going through photos of the great week we had with a flurry of international student friends coming through our door. We started with 4 girls coming over Tuesday evening...one is a girl that our son is dating, and her friend (both from England, but one is Indian), and 2 girls we are still getting to know from China...our girl from International Friends, and her best friend. We spent Wed. (day before Thanksgiving) going down to AR to drive through Eureka Springs, Christ of the the Ozarks, Thorncrown Chapel, and Beaver Dam. It was a beautiful day and we had a nice drive (despite sleepy girls and windy roads). That night we made pumpkin bars, and a batch of oatmeal chocolate chip cookies. It was the first time that some of them had ever used an oven! They were excited to hear about the things we would be making the next day for our Thanksgiving dinner. For most of the people there, it was the first time they had seen a turkey (to eat)! The next morning we started off by sending Mark and Jason off to Springfield to pick up our other guests. They included 2 more students from China, 1 from Jamaica, and 1 from Armenia. The girl from Armenia we had recently met when a mutual friend connected us through the Fri. pm shopping excursions, and we had spent a late evening a few weeks ago helping her make dolma for the International Banquet at MSU (which was amazing). My own Armenian best is brought out when I'm around her! 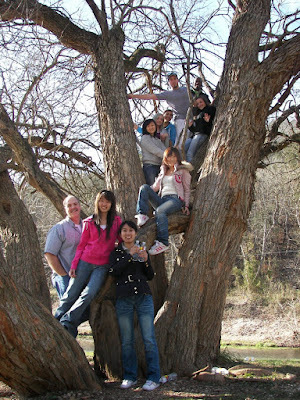 :) The 2 girls from China are the ones that we've been spending time with and helping out, and we see them regularly. Their work schedule had prevented them from coming sooner. The boy from Jamaica is a friend of Jason's, and sort of a last minute add on, but we were blessed by his presence and so glad he joined us!! After they arrived, Mark got the turkeys going in the oven, and all the girls got to see what that was all about...how they came packaged, what we do to season them and prepare them for baking, and getting them in the oven to bake. Then we had several hours to goof off, so we played ping pong and wii games at the house, and then we took an impromptu trip down to Roaring River State Park. We came back home to the smell of turkeys in the oven (we opted for 2 this year, so there would be enough drum sticks to go around!) and quickly enlisted the girls' help to put together all the sides....yams two ways (marshmallows and with pecans), green bean casserole, stuffing (I don't stuff the turkey with it), mashed potatoes, home made gravy, olives and pickles, crescent rolls....the works. I learned a lot along the way...The English take stuffing and roll it into balls and bake it, the Chinese think it's weird to put meat and milk together...something they don't do, and a ton of other stuff. Of course, it was the FIRST Thanksgiving for many of our guests, so Mark did a great job of a quick history lesson on the origin of the holiday (interesting with a little England vs America bantering going on). It was a LOT of fun! As soon as dinner was served, we put apple pies in the oven (frozen...just as good as homemade!) and we were set to go. Jason headed up clean up after dinner, and then the kids were all into the games again...until dessert, and then a trip back to Springfield for some of the guests...I was left with 3 at the house when it was all said and done. Friday we (the girls and I) went out to George Washington Carver National Park, and walked about their beautiful visitor center. I don't know if they were interested at all in his many contributions to us, but it was a good visit and they learned a bit. Then we rushed home to watch the Cassville Wildcats win the Div 3 state championship game on tv to a basic tailgating menu of Frito Pie (chili, cheese and fritos). One of the girls bf came out and picked her up to take her back to Spr., and then it was just 2. So on Saturday afternoon we drove out to Precious Moments Chapel....my goal was to see some GREAT Christmas light displays, but it wasn't happening there. I don't know what's up over there, but half of their "things to see" are closed down now...no fountain show, musical show, and hardly any Christmas lights on display...I was so disappointed, but they were happy to have gotten out to see another part of the area. Such good sports! By Saturday night, I was starting to wear out...and now I've got a nasty cold (sigh) and have been in bed recovering most of the week! It was totally worth it though, and I'd have a houseful again at any time to share Thanksgiving with them (although I might skip SOME of the driving around).